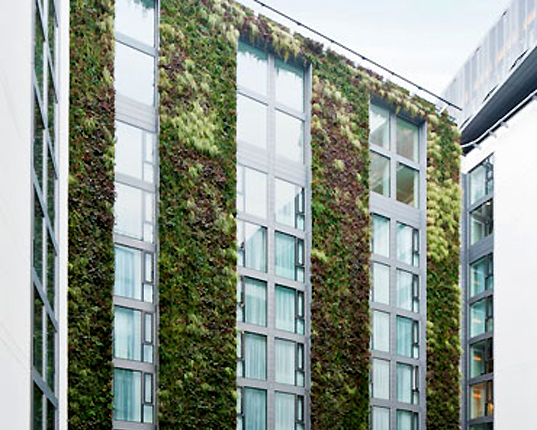 The brand new Mint Hotel near the Tower of London has only been open for a few months, but it already stands out - the building's facade features the tallest living green wall in Europe! 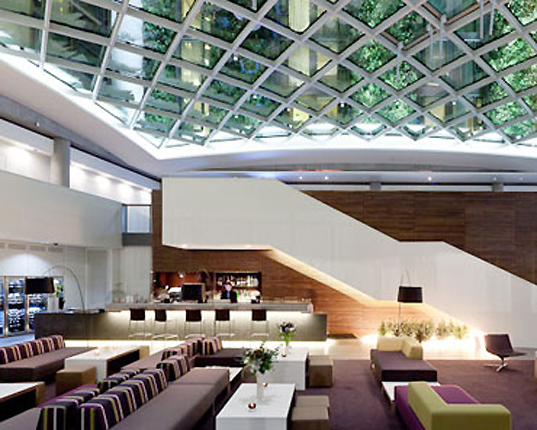 The project was unveiled just last month and it covers 1,025 square meters of the building with lush greenery. The luxury hotel is located in one of London’s most historic areas, and it has been designed to meet high environmental standards. The Mint’s lush living wall is viewable – as is the surrounding historic architecture – from the building’s floor-to-ceiling windows in the lobby and throughout the hotel. Forty species of plants make up the wall and they have been carefully arranged according to the facade’s solar exposure. Ferns have been planted in shady areas by surrounding buildings, and thrifts and red campion soak up light where the sun hits unobstructed. The wall contains 184,000 single plants divided between 4,100 planting modules. The plants were raised in a greenhouse before being transported for the living wall. The greenery is kept alive through a high-tech automatic irrigation system, which waters the plants and disperses nourishing liquid fertilizer. Should the system fail, it is connected to a message center that sends a S.O.S. in the form of a text message to the landscaping company. The roof of London’s Mint Hotel features another stunning green addition – it is carpeted with wildflowers and is set to house several bee walls as well. Rooms at the Mint start at an affordable $200/night, which includes Wifi and access to the glorious roof and views. The Mint's lush living wall is viewable – as is the surrounding historic architecture - from the building's floor-to-ceiling windows in the lobby and throughout the hotel. Forty species of plants make up the wall and they have been carefully arranged according to the facade's solar exposure. Ferns have been planted in shady areas by surrounding buildings, and thrifts and red campion soak up light where the sun hits unobstructed. The wall contains 184,000 single plants divided between 4,100 planting modules. The plants were raised in a greenhouse before being transported for the living wall. The greenery is kept alive through a high-tech automatic irrigation system, which waters the plants and disperses nourishing liquid fertilizer. Should the system fail, it is connected to a message center that sends a S.O.S. in the form of a text message to the landscaping company.